Is My Mom or Dad an Alcoholic? If you are concerned about your mom or dad’s drinking, start with learning about the signs of alcoholism. If you think that your parent has a problem, approach him or her about it and then consider different treatment options if the person is interested in getting help. Remember that your mom or dad’s alcohol addiction is not your fault. You can try to help the person. But ultimately, the decision to seek treatment is up to them. It may be difficult to tell whether your parent is an alcoholic or not. You may be worried that he or she is drinking too much and want to help. Alcoholism is a disorder in which the person has trouble controlling his or her drinking and continues to drink despite negative consequences, such as health, financial or relationship problems. Drinking a beer or a glass of wine once and a while does not necessarily mean that someone has a problem with alcohol. Below are some questions to help you evaluate your parent’s drinking habits over the past 12 months. 1 If you answer yes to at least 2 of these questions, then your parent may suffer from an addiction to alcohol. Does your parent drink in large amounts over long periods of time (e.g., several days a week)? Does your parent try to cut back or quit drinking and fail? Does your parent spend a lot of time buying alcohol, drinking alcohol and recovering from hangovers? Does your parent express a strong urge to drink? Has your parent ever failed to take care of responsibilities such as cook you dinner or pick you up from school because they were drinking? Has your parent ever missed work due to drinking or a hangover? Does your parent appear ill or anxious when he or she is not under the influence of alcohol? Does your parent continue to drink despite marriage and family problems caused by drinking? Has your parent stopped participating in hobbies he or she once enjoyed in favor of drinking? Has your parent ever driven a car while under the influence of alcohol? Does your parent have a physical or psychological problem that is caused by or worsened by drinking? Does he or she continue to drink in spite of this problem? Does your parent require more and more alcohol to appear intoxicated? In the past, confrontation was considered the best way to deal with an alcoholic. But recent research has shown that this tactic can be counterproductive and may not help the loved one to acknowledge his or her addiction. 2 If you confront your parent, he or she may become defensive. An approach called CRAFT (Community Reinforcement and Family Training) teaches family members how to talk to an alcoholic in a non-threatening and non-judgmental manner. CRAFT outlines the communication skills to use when approaching a parent with an alcohol problem. Below are some CRAFT tips to use when talking to the person. Try to catch your mom or dad when he or she is trying to quit drinking. This means that he or she has acknowledged the problem and wants to fix it. Make sure to speak in a kind, gentle, and sympathetic way. This communicates genuine concern to your parent, and he or she may respond in a more positive way. When you get upset or frustrated by your parent’s alcoholic behaviors, remind yourself of his or her positive traits when sober. This will help you to keep things in perspective. Try to have a one-on-one conversation with them. It may be less intimidating than staging an intervention with several people. Find a time when you can be alone together and free of distractions or interruptions. Try to use non-blaming language and avoid raising your voice or getting angry. Do not villainize the person. If they are not ready for treatment yet, don’t push it. Let some time pass, and try approaching them again. If they continue to refuse help, you can gather other loved ones and a professional for an intervention. Use loving and encouraging statements. These may make your parent feel more confident that he or she can become sober. Make self-care a priority. Attend an Alateen meeting for teens dealing with someone else’s drinking problems. You will be able to share your experiences with your peers and learn to cope with difficult situations. Take time for activities you enjoy, and make sure you’re getting enough rest. Support your parent as he or she researches different treatment programs and offer to attend therapy or a 12-step meeting with him or her. Don’t argue with them. If they are drunk, they will probably not remember the conversation. Arguments can also lead to physical or verbal abuse, and the person may become defensive and less likely to discuss the problem in the future. Don’t make excuses for them or support their drinking. This is known as “enabling,” and it will not help the person get better. In fact, it allows the drinking to continue and even get worse. Set boundaries with them and enforce them. Don’t use alcohol or drugs to cope with the situation. Children of alcoholics are more likely to develop alcoholism or drug addiction. Reach out to a friend, teacher, or counselor for help dealing with feelings you have about the problem. Don’t remain in a physically or emotionally abusive situation. If you are being abused, consider leaving the home and staying with a friend or another family member. Do not jeopardize your safety in order to help your parent. If you aren’t sure where to turn, you can call the National Domestic Violence Hotline at 1-800-799-SAFE (7233). It is free and confidential. If your parent is ready to begin recovery for an alcohol problem, you can help him or her explore different treatment options. Alcohol treatment programs use psychotherapy or behavioral therapy and medical maintenance to help your mom or dad become sober and live a happy, healthy life. 12-step programs: These programs, such as Alcoholics Anonymous, are free to join. The only requirement is that your parent wants to stop drinking. They are supportive and trusting environments. Individual therapy: Your mom or dad will meet one-on-one with a therapist who will address ways to become abstinent and teach coping skills to help him or her work through cravings and triggers. Group counseling: Your parent will share his or her experiences with alcohol and addiction in a group setting with people who are also in recovery. 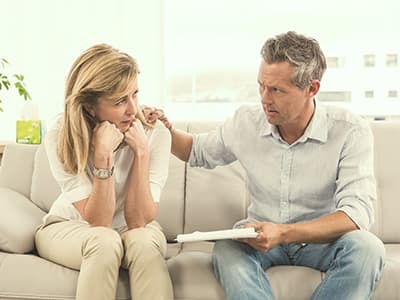 Dual diagnosis treatment: If your mom or dad also has a mental health disorder, it is best if he or she attends a facility that specializes in treating the mental health issue in addition to alcoholism. This will decrease his or her chance of relapse. Outpatient treatment: Your parent will have the freedom to live at home and take care of responsibilities while attending treatment on his or her own schedule. This isn’t recommended if he or she suffers from a severe addiction to alcohol. Outpatient programs offer many of the services described above, including individual therapy, group counseling, and dual-diagnosis treatment. Inpatient treatment: Your mom or dad will live at the rehab facility for a certain period of time while receiving all the necessary treatment to achieve abstinence. Recovery takes time, and you may need to be patient with your mom or dad while he or she completes a program and adjusts to being sober. You may also have to adjust to your parent being sober and the changes that will create in the home. To maintain sobriety, your mom or dad should continue to participate in some form of aftercare after leaving a treatment program. Types of aftercare include 12-step meetings, sober living homes and individual or group therapy.
. Substance Abuse and Mental Health Services Administration (SAMHSA) National Registry of Evidence-Based Programs and Practices. Intervention Summary – Community Reinforcement and Family Training (CRAFT).